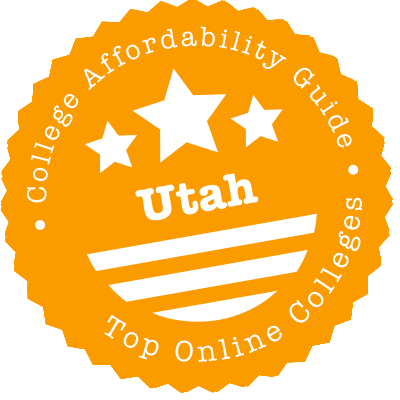 Scroll down to see the top not-for-profit colleges and universities in Utah offering online degree programs. WGU is a completely online university divided into 4 colleges, the largest of which is the Teachers College. That college has eight bachelor's level teacher licensure degrees, four Master in Education programs with teacher licensure, and another 12 graduate programs for licensed teachers. (Not to mention endorsement programs and post-bachelor's licensure programs.) The College of Business, meanwhile, houses the school's Healthcare Management, Human Resource Management and Marketing Management programs, while also running specialized MBAs and MS degrees. The College of Information Technology covers everything from cyber security to analytics. Last, the College of Health Professions runs BSN and MSN programs, as well as baccalaureate and graduate degrees in healthcare management. Utah State University offers eight undergraduate degrees and five graduate degrees: a B.S. in Agribusiness, a B.S. in Communicative Disorders & Deaf Education, a B.S. in Family Life Studies, a B.A. in Liberal Arts, a 2nd B.S. in Communicative Disorders, a B.S. in Economics, a B.S. in Interdisciplinary Studies, a B.S. in Psychology, an M.Ed. in Career & Technical Education, a Master in Instructional Technology & Learning Sciences, an M.T.C. in Technical Communication, an M.H.R. in Human Resources, and an M.N.R. in Natural Resources. They also offer several other online programs including certificates and minors. Financial aid options are available to online students in the forms of scholarships, loans, and grants. Students may take courses in full-length fall and spring semesters; 7-week sessions beginning in August, October, January and March; and 7-week and 14-week sessions during the summer, and online students may complete coursework whenever it is convenient for them. However, some courses require proctored exams. Utah Valley University offers five undergraduate degrees that students can obtain entirely online: an Aviation Bachelor of Science, an Aviation Associate in Applied Science, an Aviation Associate in Science, an Emergency Services Administration Management Bachelor of Science, and a Bachelors in Hospitality Management. Students who take online courses are able to pursue their coursework whenever it is convenient. Some courses, however, may require proctored exam, which can be taken at a certified exam proctor site or the UVU testing center. Classes begin for online students in January, May, and August. Online students may qualify for financial aid in the form of grants, loans, scholarships, and more, and the team at UVU Distance Education offers many resources that will help online students to succeed. For students who wish to transfer to UVU, credits from accredited colleges and universities with C grades or better will be accepted. Weber State University offers four associate degrees and six bachelor's degrees entirely online: an Associate of Applied Science in Computer Science, an Associate of Science in General Studies, an Associate of Applied Science in Health Information Technology, an Associate of Applied Science in Medical Laboratory Technician, a Bachelor of Science in Health Information Management, a Bachelor of Science in Health Services Administration, a Bachelor of Science in Medical Laboratory Science, a Bachelor of Science in Radiologic Sciences, a Bachelor of Science in Professional Sales, and a Bachelor of Integrated Studies Online. The Bachelor of Integrated Studies Online needs three areas of emphasis, and students can choose from child and family studies, computer science, health administrative services, health promotion, health sciences, nutrition, or professional sales. Financial aid for online students is available as it is for on-campus students. Classes begin in January, March, May, June, August, and October. In addition to regular semester-based courses, Weber State University also offers self-paced courses for online students. These are courses that start at any time and must be completed within six months. Financial aid may be used for these courses, but students must pay up-front for class and they may be reimbursed after completion. SUU Online gives students the chance to earn an Associate of Applied Science in Paralegal Studies online. Currently, there is one online bachelor program (Bachelor of Science in General Studies), with two more online programs under development (Bachelor of Science in Accountancy and Bachelor of Science in Management). SUU Online offers the following online graduate programs: Master of Accountancy, Master of Arts in Arts Administration, Master of Business Administration, Master of Education, Master of Public Administration, Master of Science in Professional Communication, and a Master of Science in Sports Conditioning and Performance. To facilitate online instruction and communication, the university uses Canvas as its online learning management system. Most of Utah’s colleges and universities actively promote distance learning. But which school is right for you? Where can you find affordable courses or even a fully online degree? And what additional costs do out-of-state students pay? That’s just a bit of what this guide covers. We’ll also tip you off to the state’s concurrent enrollment policies for high schoolers, point you toward online career training and give you a heads up on schools with quality concerns. Then, we’ll wrap it up with a list of links so you can get started. Although the state’s public schools all fall under the Utah System of Higher Education, there’s no one place to find all its online degrees or courses. Instead, prospective students may want to take the following approach. Start by using the program search tool on UtahFutures, a career and college planning website funded by the state. Choose an area of study, then see which schools offer it. The tool can’t filter out residential programs, so you’ll need to use this as a starting point for research rather than as an endpoint. That’s where you can visit individual schools’ online learning pages and get a picture of which have degrees, or at least courses, in your area of study. As you’ll see below, most schools have easily navigable catalogs. The state’s two junior colleges, Snow College and Salt Lake Community College, produce thousands of graduates each year, many from online programs. If you’re one of them, you may have designs on attending a four-year public college in the state. TransferUtah makes it easy to see which credits will count toward your major and which will be marked as electives. All you have to do is enter the name of the college where you earned your credits, the name of the college you want to transfer to, and your program of study. TransferUtah then spits out a complete list of course equivalents. Click on “Details” to see how your credits will be applied. Don’t see a course you took listed? That likely means you’ll be granted elective credit for it, meaning it won’t count directly to your major (but will count toward the units needed for graduation). Check out the Common Questions page for an in-depth explanation of how it works. Another useful tool on the website is the College Profiles section. It’s nothing fancy, but it’s filled with essential information on transfer contacts, transfer application deadlines and transfer credit policies, broken down by school. It’s not always about getting credit. Sometimes, you just need the skills to get the job done. That’s where SkillsOnline Utah comes in. Some of the 3,000+ courses are for fun (e.g., Holiday Baking), while others lead to professional certifications in everything from personal fitness training to IT. Each course comes with its own cost, anywhere between a few $20 bills and several thousand dollars. You don’t have to be a Utah resident to register. The Statewide Online Education Program (SOEP) allows 9th through 12th graders to take two free online courses per year, including Advanced Placement (AP) courses. Pass the AP exam with a score of three to five, depending on the school, and you’ll get college credit as well. Some Utah high schools contract additional online providers to enhance your options. Junior and seniors have even more opportunities for online learning via the Technology Intensive Concurrent Enrollment (TICE) program. Courses are available at $30 per credit or less, which is a steal compared to what they cost undergrads. Check out the Utah Education Network website to see what’s available, than talk to a high school administrator about enrolling. The Western Interstate Commission for Higher Education (WICHE) gives students the opportunity to attend out-of-state schools at a reduced price. Through the Western Undergraduate Exchange, associate and bachelor’s degree seekers pay no more than 150% of the in-state rate at eligible programs. Master’s-level students have their own tuition reciprocity initiative, the Western Regional Graduate Program, through which they receive resident tuition at participating programs. WICHE isn’t exclusively for distance learning, so keep that in mind when researching programs. Why are we mentioning this? Because Utah residents can apply for WICHE initiatives. Plus, eight Utah schools offer reduced tuition to residents of other Western states. Reciprocity, after all, goes both ways. A couple of schools in the Beehive State met our tough standards for both affordability and quality. If you can’t decide between these universities and other Utah options, it’s worth checking College Scorecard, which compares schools’ graduation rates, financial aid figures and average costs. USU Online has the scoop on the university’s online degrees & courses. Utah residents pay a slightly reduced tuition rate. However, nonresidents earning their degrees (or taking individual courses) online don’t pay the same rate as nonresidents in a traditional program. Instead, they’re charged a lower per-credit rate. Visit the USU financial aid office to see how to lower costs further. Much of USU’s real value is the ability to start and finish classes quickly via “FLEx courses.” Such courses allow students to minimize their lost earning potential while they study. There are two routes USU Online uses to accomplish this. First, students can take condensed courses that last four to seven weeks. Second, students can hop into an open entry course even after it’s started and catch up as they go. Not impressed yet? Graduate students can actually start taking courses before they’ve been admitted to the university — up to 12 credits’ worth — with the Quick Admission program. Utah State must be doing something right because it frequently appears in the Top 5 of U.S. News & World Report rankings for Best Online Graduate Education Programs and Best Online Bachelor’s Programs. Weber State is a public university, but WSU Online doesn’t have out-of-state pricing. Instead, it takes pride in offering students from outside its borders a low per-credit rate unavailable to their on-campus counterparts. Residents, meanwhile, pay in-state tuition for online classes, just as they would for traditional ones. Financial aid can make it even cheaper, but tuition waivers and institutional scholarships cannot be applied to distance learning courses. One big plus about Weber State is its excellent transfer guide, which pulls information from just about any school you can think of. So, whether you got an associate degree at Coastal Carolina Community College or took a few courses from BYU down the road, you’ll know what you’ll get credit for. After all, the fewer courses you have to retake, the less money you’ll end up paying for your degree. All Utah public schools (and most private nonprofit ones) seek regional accreditation, which guarantees students can receive federal financial aid and enhances their ability to transfer credits. But some schools, typically for-profits, opt for national accreditation, which qualifies students for aid but hampers credit transferability. Still other colleges, like now-defunct George Wythe University, seek accreditation from an agency not recognized by the U.S. Department of Education or eschew accreditation altogether, severely limiting the value of their degrees. The Northwest Commission on Colleges and Universities (NWCCU) is the regional accreditor for more than a dozen Utah schools, both public and private. Go to NWCCU’s Directory of Utah Institutions and check for any notes that say “warning” (potentially a bad sign), “probation” (definitely a bad sign), or “show-cause” (run away). Compare NWCCU’s list with the Council for Higher Education Accreditation (CHEA) database. The latter will be longer because it includes nationally accredited institutions. Stevens-Henager is accredited, but it’s not on good term with the federal government. Two problems dog the school, which has multiple locations in Utah along with an online presence. The U.S. Justice Department sued Stevens-Henager in 2014 after whistleblowers came forward with assertions that the school paid bonuses to recruiters for every student they enrolled, a violation of federal law. That certainly didn’t help its efforts to convert from a for-profit school to a nonprofit, and in 2016 the U.S. Department of Education denied its request, stating, “This should send a clear message to anyone who thinks converting to nonprofit status is a way to avoid oversight while hanging onto the financial benefits.” The college has since sued the federal government over the decision while maintaining on its website that it’s a nonprofit. Northwest Commission on Colleges and Universities (NWCCU): The regional accreditor for Utah colleges, NWCCU can alert you to any quality issues with the dozen or so schools it accredits in the state. TransferUtah: See how specific credits transfer between the state’s public colleges and universities (as well as privately-operated Westminster College). Utah Education Network (UEN): UEN is actually designed for teachers and administrators, but prospective students who know what they’re looking for may find it helpful. The page on the Technology Intensive Concurrent Enrollment (TICE) program should be of interest to college-bound upperclassmen looking to earn cheap college credits online. Utah State Board of Education: The board houses the Statewide Online Education Program (SOEP), Utahans’ route to distance education at the secondary school level. Utah System of Higher Education (USHE): The USHE website doesn’t have much for online students, but it does explain the State Authorization Reciprocity Agreement (SARA), which allows students outside of the state to easily enroll in Utah postsecondary distance education courses and programs. Skillsonline Utah: An initiative of the Utah Education Network, SkillsOnline Utah makes affordable noncredit and continuing education unit (CEU) courses open to everyone. UtahFutures: Although not specific to distance education, this website does maintain a complete list of programs in Utah and can point you to schools that have your area of study. Western Interstate Commission for Higher Education (WICHE): Get details on how to score discounted tuition at colleges that participate Western Undergraduate Exchange and Western Regional Graduate Program. Click on the colleges to get a full profile of degrees available, although it won’t tell you which ones are available online.